Totalitarian abuses of language are called Orwellian to honor the man who gave us the diagnostic tools to fight it, not because anyone believes Orwell cherished Stalinist obscurantism. As the Republican political machine starts to disassemble after more than a decade of dominance, it's no surprise to find its key players looking to position themselves anew. 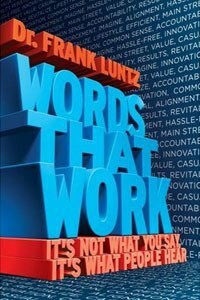 And so we have Frank Luntz, pollster and political guru extraordinaire, wordsmith to the Republican revolution in 1994, offering up a book on effective language, complete with blurbs from John Kerry and Al Franken, and with a cuddly introduction in which he asserts the fundamentally apolitical nature of his method. It goes without saying that Luntz has a shrewd ear for language and a trove of inside stories that brighten up his exhortations about usage. It might, therefore, be a surprise to learn that the book is a bit of a train wreck. Luntz makes a fetish of credibility in Words That Work, yet he continually undermines his own. A quotation from Aaron Sorkin that's in a footnote on page two reappears in the main text a mere 15 pages later. The endnotes to a chapter partly about how the Internet has transformed communication repeatedly cite a non-existent resource: "Wikipedia.com" (we'll leave off the fact that the chapter doesn't cite specific entries, just "wikipedia.com"). He confuses Scott Johnson, one of the co-founders of the Power Line blog, with Charles Johnson, founder of Little Green Footballs. In a chapter entitled "Old Words, New Meaning," Luntz attempts to show off his erudition by commenting pedantically on the etymology of various words and phrases; unfortunately, that erudition is compromised by his propensity for overstatement and inaccuracy. For example, he repeats as accurate and uncontroversial the canard about the phrase "rule of thumb" having its origin in guidelines for marital discipline. The chart of "Contemporary Youth Language and Definitions" (54-55) is hilarious. Did you know that "Shout out" means "Hello to"? "Wacked/wack" means "something very abnormal"? Really, all one can say is, "fo' shizzle" ("an affirmation of a comment or action"). Luntz's self-inflicted damage goes beyond such minor points. It's clear that he is willing to argue absolutely any position at all, depending on the needs of the chapter and without regard to internal logic. In one paragraph, for example, he claims that Coca-Cola's inability to stick with a slogan has hurt its brand, while sticking with "We Try Harder" has helped Avis stick as the second-biggest rental car brand. Of course, while Avis is famously number two in car rentals, Coca-Cola is merely the dominant company in its sector and an instantly recognizable brand. Surely being first is still better than being second? (More to the point, Luntz also repeatedly says that visual icons are at least as important as words. So long as Coca-Cola keeps the curvy bottle and the ribbon, they could probably change their slogan to Klingon without much harm.) When he urges simplicity, Luntz reminds us that the "average American did not graduate from college and doesn't understand the difference between effect and affect. Sophistication is certainly what Americans say they want in their politics, but it is certainly not what they buy". But a few pages later, when he wants to complain about media hype, he notes that "we've sacrificed nuance and judgment and distinctions, and thereby cheapened the conversation. The thoughtful musings and intellectual discourse of William Safire and George Will were replaced by the verbal slugfests of Hannity & Colmes and The McLaughlin Group -- and while possibly more entertaining, our language has suffered". Even if one wants to concede that there's been some coarsening of our language, Luntz has also noticed that "the amount of information we consume grows ever greater". In general, Words That Work gives the impression of haste and carelessness. Such inconsistencies might be more forgivable if they were accompanied by original insights into language and its function in the modern mediascape. Here, however, Luntz gets himself into some real trouble. He identifies as his main guru -- wait for it -- George Orwell! At one point he even recommends going out, reading Orwell, and then coming back to Words That Work. That's right -- the person who transformed the "estate tax" into the "death tax" is claiming "Politics and the English Language" (and its socialist author) as his spiritual lodestar. I hope Christopher Hitchens doesn't get word of this! His discussion of Orwell is an excellent example of the faux-erudition that Dr. Frank Luntz brings to the entire discussion. He writes, "if [my] critics had actually read Orwell's short but powerful essay 'Politics and the English Language,' they would realize that calling someone Orwellian is not an insult. The term is actually a badge of honor". There's something bizarre about the idea that people haven't read this essay, which is surely among the most assigned texts in first-year writing classes in the Anglophone world. Setting that aside for a second, Luntz pretends not to understand why popular culture uses "Orwellian" as shorthand for doublespeak, spin, and totalitarian language. He goes so far as to assert that the "presumed context for 'Orwellian thought' is exactly the opposite of what the author actually believed, and history has conspired to propagate this false allusion". He also points to Machiavelli, Kafka, and Rube Goldberg as others who have been co-opted in this way. It's hard to tell whether Luntz means this, or is simply content to believe American readers are stupid. Totalitarian abuses of language are called Orwellian to honor the man who gave us the diagnostic tools to fight it, not because anyone believes Orwell cherished Stalinist obscurantism. Similarly with Kafka: The absurdities of modern bureaucracy are called Kafkaesque because he helped us see the dark existential humor in these situations, not because anyone thinks he secretly dreamed of bureaucratizing society. The label "Orwellian" is thus constructed through an analogy with medicine: Diseases are frequently named after the doctor who discovered them -- Alzheimer's is a good example. It's an excellent example of popular usage's wisdom, and not, as Luntz would have it, an instance of historical illiteracy. It's clear Luntz resents being called Orwellian -- or, pace Jon Stewart, "an amoral Yoda" -- but this will hardly do. The problem with the book, in addition to haste, is that it's more or less impossible to say anything new about effective language. Whether your model is Orwell, or Strunk and White's "Omit needless words," or Barzun's "simple and direct," language that aims to incite action is best delivered as concretely and as briefly as possible. Luntz has a fine ear, but his only additional insight is that it's much easier to anticipate what people will hate than what they like. That's where you'd expect his litany of stories to come in handy. To some extent they do, but cumulatively they suffer from Luntz's fascination with the famous and from his inability to continue to kick his former opponents. (For example, Luntz repeats the lie about Al Gore claiming to invent the Internet, as well as dismissing as implausible -- heedless of Erich Segal's corroboration -- his claim about inspiring Segal's Love Story. He defends the Swift Boat attacks on John Kerry -- for example, praising right-wing blogs for keeping the ads alive at a time when the mainstream media wouldn't touch them. Though Luntz frequently cites admirable liberal speeches, they are usually by speakers who are safely dead.) When Luntz focuses on the technical details of his work with focus groups and with clients, Words that Work offers glimpses of the book it might've been. Luntz's advice to put down Words That Work and read Orwell is excellent. To that end, a link to the full essay is provided below. Irony of ironies, the essay is hosted by the Plain Language project, a government initiative that dates to 1994 and was given the imprimatur of President Clinton in 1998. Their website, plainlanguage.gov, anticipates most of what Luntz says here. "Politics and the English Language" ought to be a bracing corrective to Words That Work's rhetoric, a rhetoric that notes that "perceptions trump whatever 'objective' reality a given word or phrase you use might be presumed to have". Frankly, I liked Republicans better when they scorned such relativism.